Say, what did Richard do, anyway? Let's tally it up! He's smart, polite, and a golden boy teenage Irish athlete. ...even cleaning up after them. He and his friends josh each other good-naturedly, with no bullying or cruel teasing. He sings rich, lyrical traditional Irish ballads. ...and shows her genuine love and emotion. ...and is especially great friends with his father. He hangs out in bookstore cafés. He reads books. Including The Hobbit. Most amazingly, we never see him use a computer. Who is this kid? What a boring, milksop, weed of a personality to build a drama around, huh? So, let's get out of the way exactly what Richard did: he killed someone. Accidentally, in a fistfight, but still, he killed someone. That's a spoiler alert you probably didn't need: after watching Richard and his band  the term "gang" doesn't even fit them  you'll spend the first half of the film waiting for director Lenny Abrahamson to pull the rug out from under you and his characters. Probably the only clues we're given that there's tragedy on the horizon is the caustic personality of his girlfriend's ex Conor, and the stormy, wild wind  it's always overcast, even when the teens take a holiday out of Dublin. Contrary to our perception from the media of wild ASBO youths in Britain and Ireland, Richard and his friends are happy, fun, unscrewed-up youth  at first. Even their mobile ringtones are just telephone bells. If the first half of the film is a cheerful romp on a teeter-totter, the descent after the climax is heartbreaking and anguished. 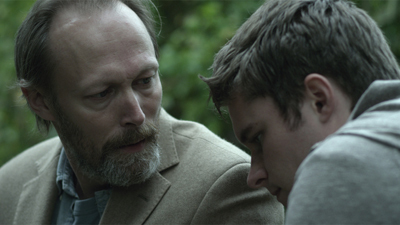 Without hammering the point in with tacked-on morals, Abrahamson explores the psyche of a boy and his community and close cirle haunted by his completely unintentional deeds. 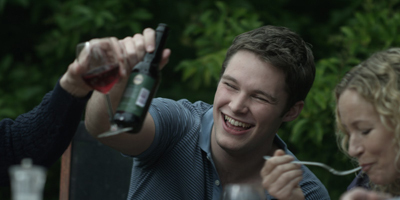 At a slim 88 minutes, it's remarkably packed with brilliant, beautiful moments, much of it due to Jack Reynor as Richard. Reynor has such a light and subtle touch to his acting it's hard to see why his next big film is 2014's Transformers: Age of Extinction. Scriptwriter Malcolm Campbell adapted the story from Kevin Powers' award-winning novel Bad Day in Blackrock, itself based on a true incident, and the pace and dialogue are compellingly realistic, but it's the winning combination of director and cast that break What Richard Did away from, well, all those other movies where teens accidentally kill a peer, and they (and their fathers) suffer for their secrets. I'm lookin' at you, At Any Price. Abrahamson rises above cliché and his direction is extremely naturalistically effective, with its lengthy but brisk digressions and realistic overlapping dialogue. 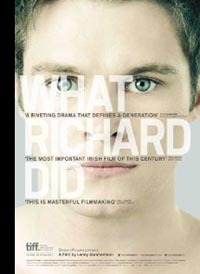 What Richard did is a crime, of course. His Catholic guilt assures us it's also a sin. But Abrahamson presents it clearly and starkly  it's an incident, and it's terrible. As a metaphor for the growing pains of an anguished teenager and the curves thrown at youth it's exemplary; as a symbol of young urban youth in general, it's brilliant. For details on What Richard Did at the 2013 Tribeca Film Festival, visit the festival website.